You can access the Options Menu by pressing the Escape key once you are in the game. If you wish to adjust the video options, you can do so by accessing Settings from the Regnum loader, after you input your username and password. Keep in mind that by pressing the "O" key, you also have access to in-game video, controls, game and audio settings. Use the "W", "A", "S", and "D" keys (respectively) on your keyboard to move your character forward, left, right, and back, or use the arrow keys. Pressing both mouse buttons at the same time will also make your character move forward. Your character will run by default at all times. 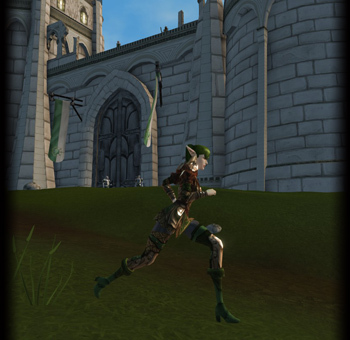 If you want to slow your speed down you can toggle between running and walking by hitting the "Z" key on your keyboard. Press the "F" key to enable autorun. Your character will stop when you press the forward key, the backward key or the "F" again. While running, you will also be able to control the direction your character is going, by holding down the right mouse button. Holding the left mouse button down allows you to turn the camera in any direction to check your surroundings. 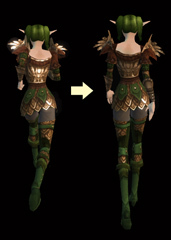 Changing the camera view will not change the direction your character is facing. 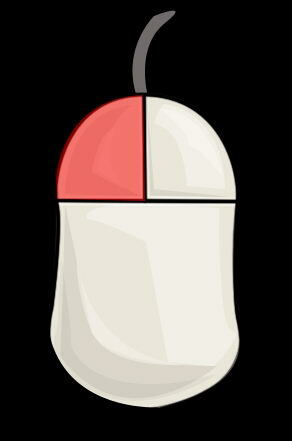 You can use the mouse wheel to zoom in our out from your position. 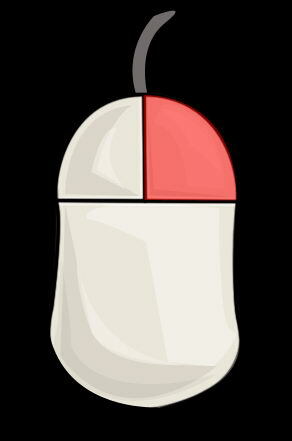 If you do not have a mouse wheel you can hold both mouse buttons down by pressing down the "Alt" key, and move your mouse to achieve the same result. You may change the camera zoom level while moving your character. Attacking requires your character to have the target in range to initiate an attack. If you are out of range a message in your Game Window will prompt you to move closer. Initiating an attack is done by left clicking on the target you intend to attack. When an attack is initiated you your target will blink red for a second. Make sure your weapon is drawn. If you attack without your weapon drawn, your character will automatically draw a weapon to attack but this will give extra time for your target to attack you. The quickest way of getting the first attack on a target is to draw your weapon and left click on your target while out of range. As soon as you move into range your character will attack once it has stopped moving. 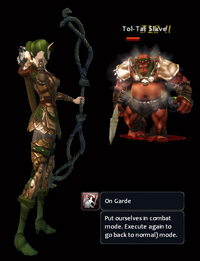 You cannot move and attack at the same time while using ranged weapons, although melée classes can attack while running. The Action Bar is located at the bottom of the screen. It shows the experience needed to advance to the next level (see Experience), all available quick actions, and all character info, including the spell book. CoR offers players unique opportunities to create parties, private chats, and trades. To trade, simply select character you want to trade with, select the button marked by a cube with two arrows. The other character will be asked if he/she wants to trade, and if they accept the trade window will open. Select the item you want to trade by dragging it into the Trade Window. You may also trade any gold amounts. Both players must agree if the trade is to take place. Other player interactions are conducted the same way and all of them can be found in the Actions Menu, which can be accessed by pressing the "N" key. You may increase or decrease the sound/music volume in the game by pressing "ESC" and accessing the Settings section. You can also choose to turn off/on the combat music. 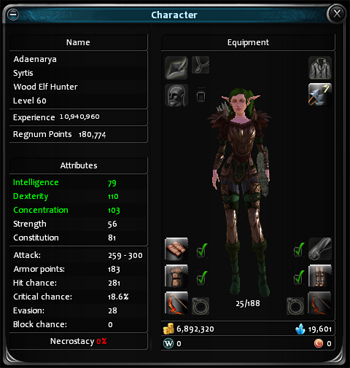 All character info is easily accessed by using the right part of the action bar. By clicking on any of the buttons, you will be able to access your character's level, attributes, equipment, inventory, party, and quests. Press the "C" key to get a quick look at your character's current equipment, as well as the currencies you already have. For more info, click on the "+" at the upper left corner of this window. When a character has gained enough required experience to advance to the next level, it levels up, obtaining a raise in all attributes. Experience is gained by completing quests or defeating challenging creatures. The only way you can acquire new spell and abilities is to level up by gaining experience. Each time your character gains a new level, he/she will be awarded points to spend the next time you visit your trainer. Here you can choose to spend your points on a new spell or power in a chosen category. To cast a spell open your Spell Book from the Action Bar. You can find it by pressing one of the buttons in the middle, the one that resembles a book. When this window opens, you will see all the spells' categories and the spells that you currently have available. Click and drag the spell you want to the left of the Action Bar where there are empty numbered slots. You can let go when the spell lights up, and the spell will stay in your quick bar. Close the Spell Book, and once have find an appropriate target, select the spell and your character will cast it. You can customize up to four Action Bars for fast recall of strategic sets of spells or actions, toggling between them with a button to the right. Equipping items is easy. 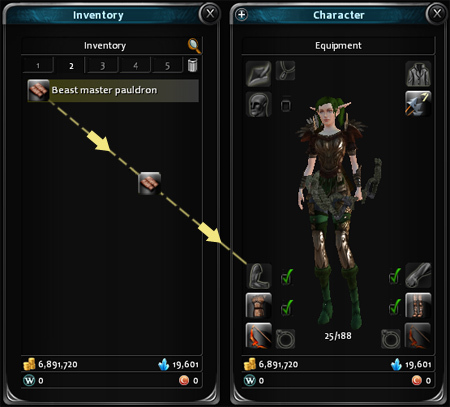 Open the Inventory Window for a character by selecting the button from the Action Bar that resembles a bag. Here you will find all of your equipped items, and all items that are currently in the inventory. 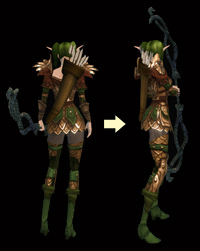 To actively equip an item, double click on it, or click and drag the item to the appropriate body part. For instance, to equip a helmet either double click on the piece of equipment to automatically equip it, or click and drag it to the character's head box. You can also perform a search whenever you wish to find an item in your inventory. To do so, click in the "magnifying glass" in the upper right corner of the inventory, then write down the name of the item you want to find. 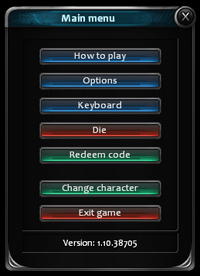 To log out of the game at any time, simply press the Escape key on your keyboard and select the Exit Button. A countdown will appear that will allow you to change your mind if you selected this by accident.